The princess requested something chocolate today, preferably with cream cheese icing. 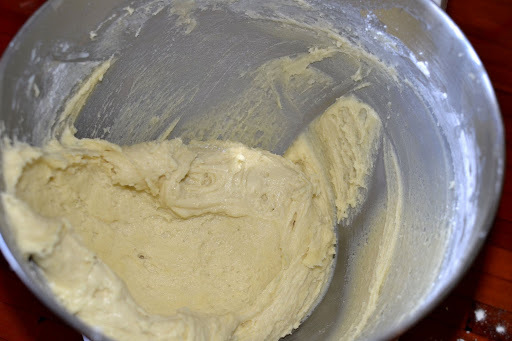 I feel like I’ve done a lot of cream cheese icing recently so I settled on something a little different. 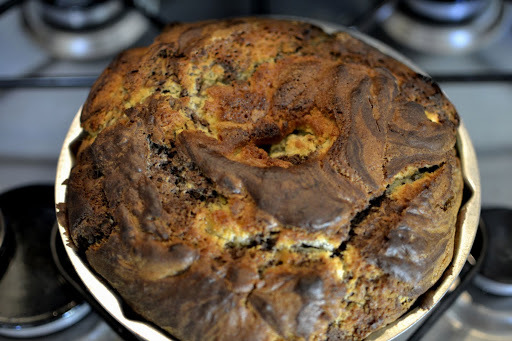 This recipe is from Ngonu, my grandmother, and is usually an orange-chocolate-vanilla marble cake. The princess objects to chocolate and orange for reasons I do not really understand, but then the princess has many food objections which I do not understand. 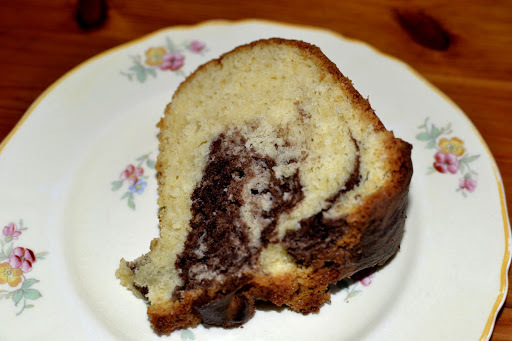 So in efforts to appease the princess I’m making regular chocolate-vanilla marble cake. The chocolate part of this cake is made with cocoa. Making cake with cocoa is something I don’t seem to do very often even though the cake that is requested of me the most is a cocoa one – go figure. I guess I’m just not really a chocolate cake person. (I prefer brownies as a rule and they’re all about the chocolate quality.) This cake brings back various memories of childhood and Ngonu and proves (to me anyway) that food is important for memory. The recipe is found in my mom’s handwritten recipe book which I spent hours pages through as a child and which I still refer to for certain recipes. Eating this cake was my first experience of the magic of chocolate-orange. I don’t make it often but it is one of my favourites. Especially with tea. 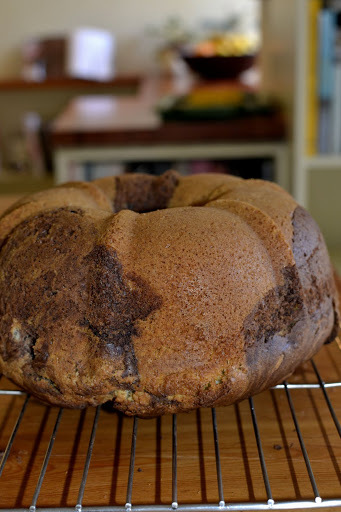 Preheat the oven to 180C and grease a bundt tin. Cream the butter and sugar until white and fluffy. Add in the eggs, beating well to incorporate. Add in a cup and a half of the flour plus the baking powder and salt. Beat well then add in the milk followed by the rest of the flour. Beat for 2 minutes on a high speed so that everything is well mixed. 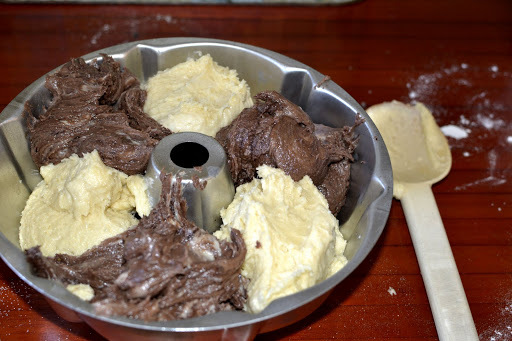 Then separate half the mixture into a new bowl and add in the cocoa powder to this half of the mix. 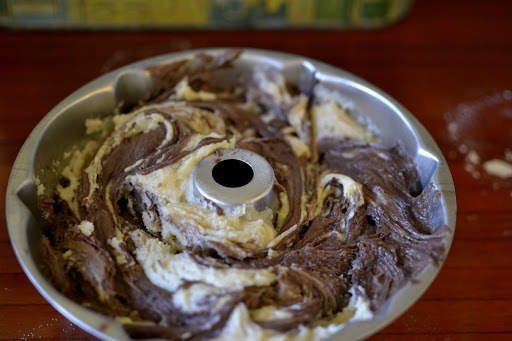 Put alternate dollops of the mixture into your tin and when all is added, swirl the mixture to create a marble effect with a knife. Bake for approximately 35 minutes until a skewer inserted comes out clean. Eat plain or with chocolate orange buttercream. Be careful when slicing because the top forms a crust which can crumble. Cream the butter and sugar until white. Add in the orange rind followed by the cocoa. Mix well and use immediately. * Dissolving cocoa in hot water removes the bitterness sometimes associated with it. 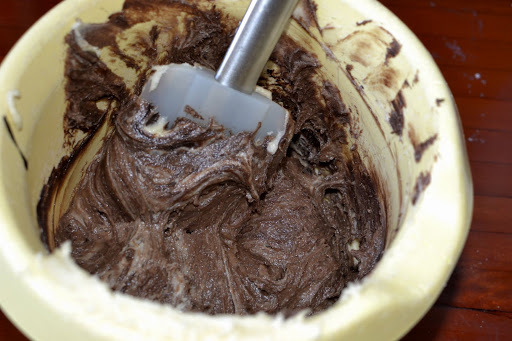 **If you’re making the chocolate orange version, substitute the 30ml milk amount for 30ml orange juice and add in the rind of one orange to the butter/sugar mixture.